Kedartal, as the name indicates its Lord Shiva's lake. 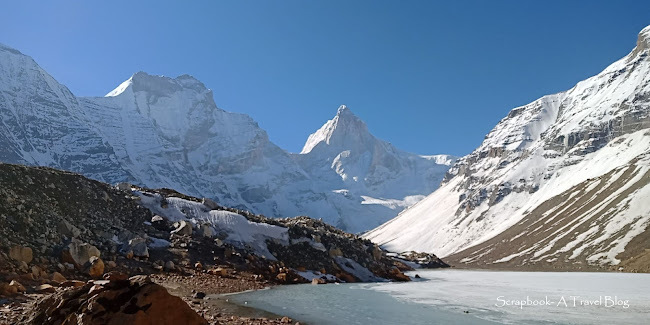 The legend says Shiva created this lake as a contribution to River Bhagirathi. 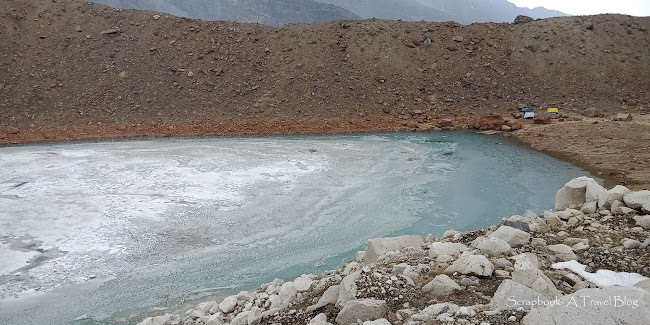 The lake is believed to be the origin of Kedar Ganga, a tributary to Bhagirathi which joins the river at Gangotri. But, in that landscape you happen to see Kedar Ganga originating from a glacier which feeds the lake too! After injury at Chadar trek I was thinking that my left hand is gone forever! Very depressed, I was pushing hard to get some movements in the wrist. Had never thought I could go for a trek within 4 months of injury. Still decided to make it to Kedartal with only one hand operational. Initially it sounded like madness but, later I didn't regret. It was hard but wasn't as hard as I believed. 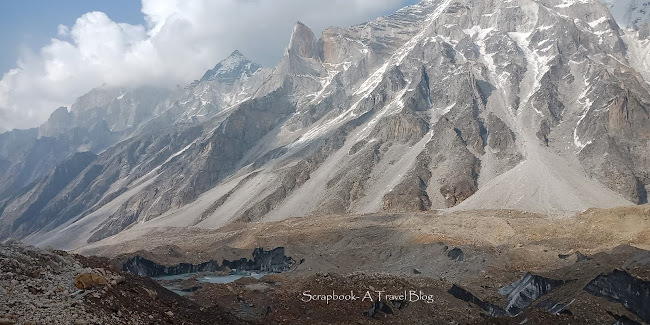 The trek starts from Gangotri and the trail is steep uphill including numerous switchbacks through birch forest. Birch trees are referred to as Bhoj trees in local language and so the first campsite inside the Bhoj forest is named Bhoj Kharak. The trail is well marked, other than all uphill terrain there is nothing much to talk about. Just few meters before the campsite the Spider Wall crossing is interesting. Almost vertical granite with couple of inches wide footholds and quite a deep valley below ... well it is not as scary as it is mentioned in all websites. But, yes! one needs to be careful. The second day of trekking from Bhoj Kharak to Kedar Kharak is comparitively easy on knees but tricky and very interesting! Steep climb, blue sheep pushing lose rocks from top, we dodging those falling rocks, crossing sliding zones, river crossing at places. I loved it. What is the fun in just walking and walking? It is fun to get some dust and dirt. The real heroes are the porters. I envied them, their immunity towards the cold, altitude and the terrain. When our team, well equipped with vibrum sole trekking shoes and saying "mein guide ke sath hi jaoonga" (I will go only with the guide), these guys were walking in a pair of flimsy slippers with no grip at all and carrying a backpack of the size of an almirah! I heard they carry about 30 to 50KG! They deserve a story of their own. We had started late in the morning and got to experience some snow fall at the end. I was in a open area, there was nothing to hide and strong cold wind brought snowflakes. Snowflakes were ramming to my face. The light weight poncho wasn't of any use, it was flying in every direction except to protect me from snow and wind. The romantic looking snowflakes which come in slow motion aren't so in reality, they seemed too hostile and felt like ripping my facial skin. On the mountains you can hardly do anything but accept the situation- if hot sweat, if cold shiver!! There was no option than walking ahead. Fortunately, the storm was brief and the last stretch of the trail is almost flat and opens up into a beautiful grassy meadow with views of high peaks and blue sheep grazing around. 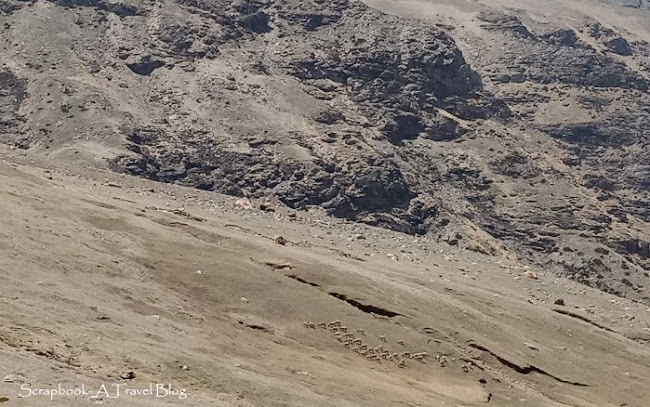 Since, Kedartal has not gained much popularity as Roopkund the campgrounds are sparsely occupied. Kedar Kharak campsite is one of the best. Wide grassy ground gently sloping down and once a while the pretty visitors- Himalayan Blue Sheep grazing lazily. The campsite has good old mountains around, space, peace, quiet and some craziness. 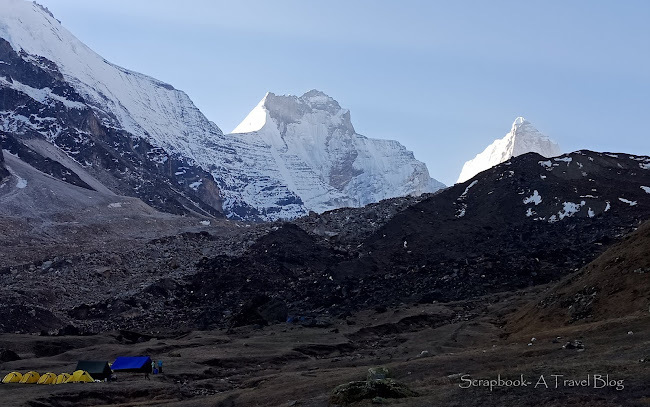 Only a group of Indiahikes had camped and ours. One of the best campsites ever! A herd of blue sheep arrived and the whole campground came to life! People with cameras tried to approach them in all possible angles and postures. Others just stood around and took videos and pictures with mobile phones. Watching the sheep a thought came to my mind- on treks our existence comes down to that of these sheep. We want to survive, eat and sleep. Nothing else matters. On the third day trail from Kedar Kharak to our final destination- Kedartal was rocky, harsh and looked never ending. For me the tension of reaching somewhere before the weather got bad was mounting. Today I was better prepared with waterproof pants and wasn't relying on the poncho only. But, there was no snowfall or rain, it was a very pleasant day! 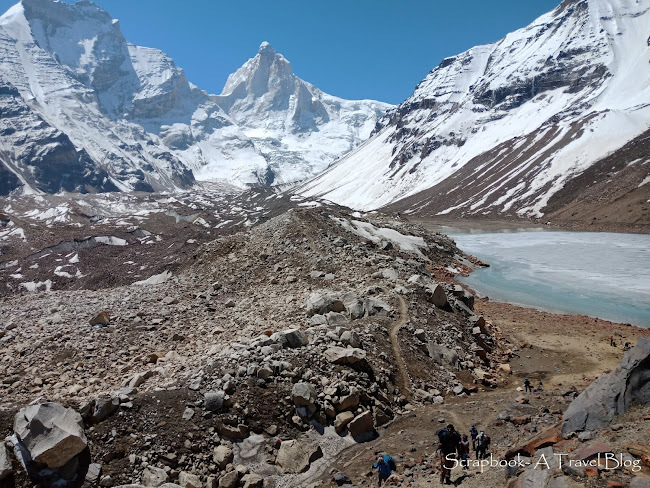 After going up and down on the rocky moraines the final steep climb through the lose rocks and slushy slippery mud kind of induced the effect of altitude. Almost at 16,000ft air is thin, crisp and dry. Climbing 4 steps makes you huff and puff! I went up like a zombie, every two steps I stopped and looked up to judge how much more! Finally, I was there!! Dumbstruck!! The view was stunningly beautiful in "high altitude colors"- white and thousand shades brown. Well, there was blue of the sky at times when those cottony white clouds moved. It looked like magnificence redefined! I forgot about my tired limbs and tried to capture the sheer scale of the mountains with my mobile phone. Some pictures I captured are here though any camera cannot do justice to the spectacularly magnificent grandeur of the place. Went around the place and clicked pictures ... so many of them! The romance of staying in a tent pitched right beside a frozen lake and watching the moon-rise is beyond words to express. The moon slowly rose up from behind Mt Bhrigupanth. It was just a night after full moon and the light filled everywhere! I sat there on a rock on the lake bed and looking at Mt Thalaysagar when others tried to do some long exposure photography. A porter came for water and asked me gently ... "Madam Ji, kab tak yahin baithi rahegi?" (Madam, How long will you sit here?). My respose right away was ... "Marne tak" (Untill death). Soon thick clouds covered the place, dampness was felt by the skin and it was time to get inside the tent. At high altitudes I cannot sleep. And while trekking above 8,000ft I just don't get sleep for a week or so. And hence I keep coming out of the tent every night just to look around, and the star filled sky. At Kedartal I came out to check twice at 1AM and 3AM. First time there wasn't much the mist had covered most of the mountains. But, the second time was dreamy. The moonlight had lit up the whole place. But the thin curtain of clouds masked the sky and the light was diffused and dimmed. The stars were hiding. The enchanting and otherworldly beauty of the mountains soaked in the dim moonlight was like a dream. Trust me! A moment's sight of Mt Thalaysagar shining under the moonlight was worth freezing myself for few minutes. I don't have words to explain it. It made me forget everything else and I was eternally happy! I could stand there and watch forever! It was bitterly cold but the haunting beauty of the landscape was hypnotic. I thought of making friends with the bitter cold. Staying back at places like Kedartal is not an option. Next morning we had to leave. With tons of memories and camera full of pictures we left. Even though Kedartal is not ravaged like Roopkund or Goecha La the plastic still has made its presence. I could see some Pepsi Cola bottles on the surface of the frozen lake. Oh! When are we going to learn? Well, another drill on sliding zone and descending the steep downhill trail finished our memorable trek. At Gangotri while we settled the dues etc I finished two big fat aloo parathas effortlessly. The jinx! 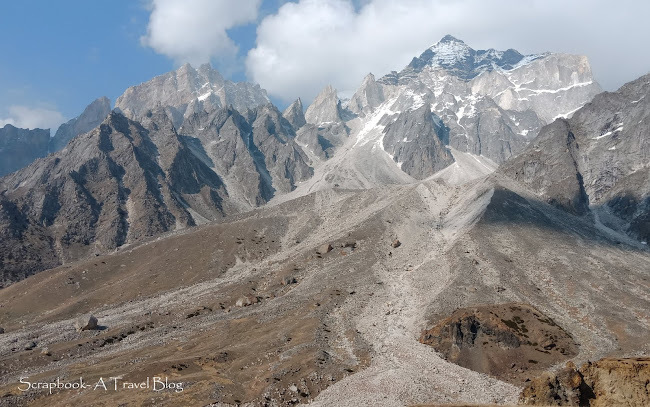 Unfinished Moon Peak, unwell on Goecha La trek and injury on Chadar!! I broke the jinx!! I finished Kedartal with no issues! Yey to me!! Everglades National Park, An Alligator Alley! Wow, wow, wow!! Stunning pictures and nice write-up. How is your wrist now? Hope you give it some rest before your next adventure. Your blog is a very good travelogue. Thanks! My wrist is fine now. A trekker's dream indeed. The breathtaking splendour of the Himalayas cannot be matched. Wow! This is just awesome. Hope your hand is fine now.